Red Hippo: notes on parental love. the other day i was reading my favorite children's book to easton. 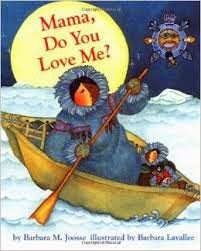 the book is called, "mama do you love me?" for some reason (maybe it's the co-dependent in me), i have loved that book my entire life. my mom read it to me, and as soon as i had easton i began reading it, nightly, to him. i have a beautiful framed print of the book hanging in my room, and my mom gave me a pin (of the mama from the story), at sailor's baby shower. when i read "mama do you love me?" to easton the other night, i thought about just how much i love my two little boys. it's a lot. obviously, as a parent, you expect to love your children; but it's hard to pin point just how weight of this love permeates our being. this thought crossed my mind; "does easton love me as much as i love him?" the answer i found is, no. no. he can't. he won't. ever. but that's okay. i will never love my parents with as much intensity as my parents love(d) me. but i love my children as much as my parents do/did. maybe, all we can do as parents is teach our children about love, respect, adoration, discipline- so that one day, when they have children of their own, they are able to feel the same way about their kids as we do about ours. i might never be able to feel the same intensity of love towards my mom as she feels towards me- but i get to direct that same love straight onto my children. where it needs to be. one day, they will do the same. it's a beautiful thing, this intense, parental love.